Many people consider gossip to be a harmless pastime. “My Name Is Gossip. I have no respect for justice. I maim without killing. I break hearts and ruin lives. I am cunning and malicious and gather strength with age. The more I am quoted the more I am believed. I flourish at every level of society. My victims are helpless. They cannot protect themselves against me because I have no name and no face. To track me down is impossible. The harder you try, the more elusive I become. I am nobody’s friend. Once I tarnish a reputation, it is never the same. I topple governments and ruin marriages. I ruin careers and cause sleepless nights, heartache and indigestion. I spawn suspicion and generate grief. This eye-opening poem from an unknown author says a lot about the damage done through gossip. What about the famous phrase we all have heard. “Sticks and stones may break my bones, but words will never hurt me”? In our hearts, we know this is not true, even though it may be a useful attitude to take when insulted by others. Reciting those words does not take the hurt away. Words do tremendous damage. So unless you’ve been a victim of violent crime or of a major illness or something else catastrophic, your deepest pains have probably come from hurtful words. Words carry great power. God created the world through His words. He said, “Let there be light” and there was light. Humans also use words in producing great novels that move us and music that warms our hearts. Writers put much thought into the right selection of words so their books or songs will sell. We listen and communicate words every day that either lift us up or bring us down. Powerful, positive words can offer great healing, while negative words contain great destructive power. Whenever we talk negatively about people or listen to someone else talk negatively about others, we unleash that harmful power. So how do we use this power of words with others? Do our words lift and inspire, or do they destroy? Are they words of truth? Do we disclose truth in a hurtful way? If someone paid us 10 cents for every kind word we said about people, and collected five cents for every unkind word, would we be rich or poor? Gossip and slander can ruin reputations, families, break up marriages, separate friends, destroy communities and, yes, even divide churches. Knowing that gossip is so destructive, why do we do it? We also gossip to draw people into our own hurt and anger. We want others to side with us so we must tell our side of the story. Then our friends repeat the story to their friends and on and on it goes. Even if you say the truth, it does not justify unnecessarily passing on hurtful information about someone. Gossip is a six-letter word that produces emotions of excitement, pain or guilt, depending on if you are the gossiper, or if you are the one being gossiped about. We should realize that participating in negative conversations harms us spiritually; it creates confusion that can lead to deception. Pain comes when we are on the receiving end of the gossip trail. Speaking ill of others is particularly bad because words, once uttered, can never be recalled. Consider the following story illustrating this point. There was a man in a small town who went around slandering a minister. One day, feeling bad about what he had done, he went to the minister to ask for forgiveness. “Take a pillow,” said the minister, “cut it up and shake out the feathers.” The man did as he was told and then he returned to the minister hoping to now be forgiven. “It’s as impossible to repair the damage done by your words as it is to recover all the feathers,” said the minister. Gossip also hurts the gossiper. According to psychiatrist Antonio Wood, when you speak ill of someone, you alienate yourself from that person. Say bad things about many people and your words will separate you from them. Guilt is an emotion we feel when we know in our hearts that it is wrong to slander and talk about someone behind his or her back. Have you ever tried to look someone in the eye after you have talked about him or her behind his or her back? Gossip may be fun for a moment, but in the end it will only produce hurt, guilt and pain. 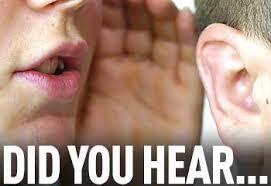 HOW CAN WE AVOID GOSSIPING? · Seek a repentant and clean heart from God so you’ll have the power to resist talking negatively about others. Take a look at the attitudes you hold and the comments you make. Examine why you are tempted to speak negatively and pray for God to give you the strength to confront and overcome those temptations. Confess the times you’ve gossiped or criticized in the past, and invite God to transform you. Release any pride or fear that is obstructing you from making the changes you would like, and be open to God’s correction and guidance. · Pray for people you have hurt—either purposely or inadvertently by speaking negatively about them. Ask God to heal them. Also pray for people who have hurt you in the past through their negative words about you. Forgive them and ask God to let them be aware of His loving presence with them. · We can ask God to help us resist being pulled into negative conversations. How can we do this? · Think. Another key to positive communication is to subscribe to the simple formula “THINK” before speaking of any person or subject that is controversial. If what we are about to say does not pass these tests, we should keep our mouths shut. · Finally, remember the little saying that tells us what kind of minds we have: Great minds discuss ideas; average minds discuss events; small minds discuss people. By applying his instruction, gossip can be stopped. Let us all strive to use the power of our words for healing.